Fylde crashed out of the FA Trophy at the hands of their Vanarama National North rivals, who were two up inside 11 minutes. 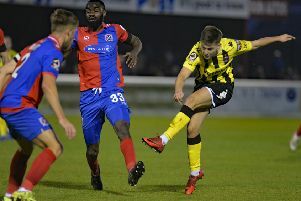 Those strikes by Glenn Walker and James Armson were added to by Matt Lowe and David Moyo to condemn Dave Challinor’s side to their third defeat of the season in this first round replay. Manager Challinor made two changes to the side that had been held 1-1 by Brackley at Mill Farm for the second time this season, with Dom Collins and Dan Bradley replacing Steve Williams and Brendon Daniels. The Coasters got off to the worst possible start, falling behind inside five minutes. Richie Baker took down his man 25 yards from goal and Walker stepped up to fire a sensational free-kick into the top corner. Things quickly went from bad to worse for the visitors when Matty Hughes cynically tripped Ellis Myles in the box and the referee had no hesitation in pointing to the spot. Armson stroked the penalty high into the top right corner. Fylde were out of sorts and Armson almost capitalised again in acres of space in the box, but keeper Rhys Taylor was equal to his low strike. Lee Ndlovu wasn’t far from making it three in the 20th minute, when he met a cross from the right with a cushioned header straight at Taylor. The first real chance for the visitors came by the way of a hooked Bohan Dixon strike that was comfortable for Laurie Walker before Darren Stephenson attempted to divert in Matty Hughes’ left-footed shot but couldn’t get enough power on a chested effort. Stephenson, on loan from Tranmere, had a glorious chance to halve the deficit shortly before the half-hour, when he was played through by Hughes but lobbed over the bar. Stephenson was looking the main threat for the Coasters and carved out another opportunity after beating his man on the edge of the area but lashed the ball narrowly wide. Taylor had to be at his best as Brackley continued to pile on the pressure, pulling off a fantastic reaction save to deny Lee Ndlovu from point-blank range. Centre-half Alex Gudger and Armson both missed glaring headed chances within a minute of each other as the Coasters struggled to cope. However, just a minute before half-time the hosts had their third. Armson played Matt Lowe clean through the middle, and although Taylor saved the initial effort the ball bounced up kindly for the midfielder to nod into an open goal. Coasters midfielder Dan Bradley hit a fizzing shot from 20 yards that was tipped around the post as the half drew to a close. Half-time substitute Danny Rowe went close to pulling one back with his first contribution, twisting and turning before firing narrowly over. The scoreline was becoming embarrassing for the bewildered visitors as Steve Diggin raced through unmarked and crossed for David Moyo to head home from a yard out on 53 minutes. Diggin almost turned scorer himself but Taylor was once again on hand to keep the score down, tipping the striker’s acrobatic shot over the crossbar. Rowe fashioned a rare chance for the Coasters with a sensational drive from fully 35 yards that was palmed over by the keeper. Winger Stephenson turned his man on the edge of the area as Fylde looked for some way back into the game, but his final effort drifted the wrong side of the post. Rowe headed another opportunity wide as the visitors enjoyed the better of the closing stages, but there never looked any real threat to the Brackley goal and the Northamptonshire side will visit Stockport County in the second round on January 14. Brackley: L. Walker, Myles, Gudger, Lowe, Graham, Dean, G. Walker (Byrne 88), Armson (Cox 89), Ndlovu (Moyo 46), Diggin, A. Walker. AFC Fylde: Taylor, C. Hughes, Langley, Collins, Kennedy, Baker (Bond 46), Bradley, Dixon, M. Hughes (Daniels 46), Stephenson, Blinkhorn (Rowe 46). Subs not used: Thompson, Williams.